2. Facebook Pages integration. 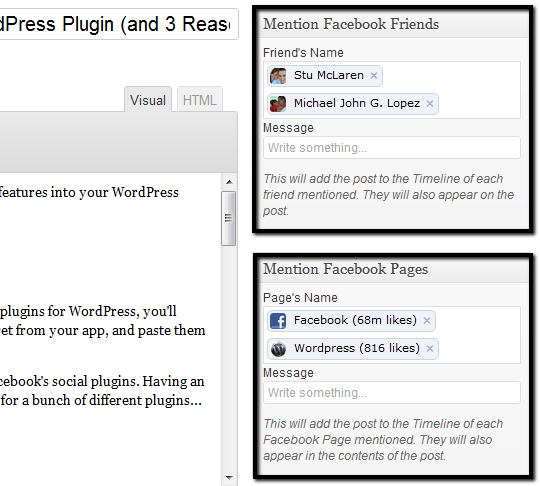 Out of the box, the Facebook for WordPress plugin integrates with your Facebook pages. This is huge, because, chances are, you use a Facebook page, not your personal profile, in connection with your blog. Having pages integration out of the box lets you automatically post new posts to your Facebook page, integrate a Facebook Page Like Box, and more. And, it’s all built into the plugin without the need to install a bunch of plugins or create a bunch of apps (see #1). 3. Easy Like, Send, and Subscribe buttons. Once you’ve integrated the plugin with a Facebook application, you can easily add Like, Send, and Subscribe buttons to your blog posts. Simply check a few boxes, select where you’d like them to show up, and you’re all set. The plugin also includes sidebar widgets for adding Like, Send, and Subscribe buttons making adding these items to your sidebar a snap. 4. Simple Facebook Comments. If you’d prefer to have Facebook-only comments on your website (a good anti-spam strategy), this plugins makes it a breeze. Much like the Like, Send, and Subscribe buttons, adding Facebook comments to your posts is just a few clicks and you’re all set. 5. Powerful content recommendations. The Facebook for WordPress plugin also includes a Recommendations Bar feature you can easily add to your website. The plugin will recommend content across your site to your readers. The powerful part is the fact that these recommendations are based on all the social and interest related data Facebook knows about each individual reader and the content of your site… making these recommendations highly targeted for each visitor to your site. 6. User and Page tagging in posts. Probably, one of the coolest parts of this plugin is the ability to tag your Facebook friends and Pages when you posts new posts. Tagged users get the post in their timeline, as well as, their name added to the post on Facebook. This is a powerful way to draw specific people into your posts and jump-start the comments, likes, shares, etc. 7. Official. As I mentioned, this is the “Official” WordPress plugin from Facebook. That means it’s reasonable to expect that, as the plugin is developed, it will contain all the latest features and options available from the Facebook API. Probably even more important is the fact that if Facebook changes something… they’ll now have to change the plugin to match… instead of you having to wait for a third-party developer to make the changes. So, the upgrade/change process should now be much smoother. 1. Deep integration is a bit confusing. In order to access some of the more advanced features of the plugin, you have to walk-through a deeper Open Graph integration. Unfortunately, that process is a bit cumbersome. You have to go into the Open Graph, create a new action type, create a new object type, create a new WordPress post for that action and object type, request and approval from Facebook, etc. Yeah, it’s long and if you’ve never messed with the Facebook Open Graph, it can be confusing. Hopefully, in the future that gets easier, but for now it’s a bit messy. 2. Facebook takeover. Depending on how much of the functionality you use from the Facebook for WordPress plugin, it becomes real easy for Facebook to take over your site. If you’re social strategy is primarily Facebook-focused, that could be a good thing; however, if you want to integrate with other social platforms (Google+, Twitter, LinkedIn), it will probably be difficult to get a smooth integration while using this plugin. Have You Tried the Facebook for WordPress plugin? Have you tried the plugin? What’d you think of it? What tips or suggestions do you have? I prefer DISQUS but if you were using say livefyre I wouldn't be able to leave a comment as it doesn't work in my browser/laptop/OS. I haven't… probably because I haven't anything with it. I used to use the Facebook comments, but you get a lot less comments and I have a bunch of old WP comments on certain posts… so I went back to IntenseDebate. I've used it cuz I had used Disqus a long time ago and hated it. Probably should check it out again. DISQUS added a host of new features in 2012. They really should hire me as I keep telling people to install DISQUS in particular instead of Facebook Comments. It is interesting you noticed less comments while running Facebook Comments. I run a spectacularly unpopular blog, but it is old and I use it test plugins etc. etc. I've got it running pretty well and to me the biggest problem having blogged for 7 years or so is spam. I fought spam diligently and part of my current solution is DISQUS. The largest newspaper in Vancouver recently switched to Facebook Comments to force people to not be anonymous assholes online, but I think forcing citizens to use one corporations product in order to exercise their right to free speech is short sighted to say the least. DISQUS allows for the use of multiple logins, probably more different ones than any other out of the box comment system. It imports old comments. It keeps a copy of your comments locally. It supports Facebook and you have some control over allowing anonymous comments or reviewing comments before they go live. It integrates with Akismet. Yeah, my boss uses Disqus on his personal site and I've considered trying it again. I just don't have a ton of complaints about IntenseDebate. As for spam, I use Akismet and rarely have any issues. I get 1000s of comments marked as spam and I can see those numbers… but only every now and again does one actually make it through where I see it on the comments page. I'll check DISCUS out Muskie thanks for your POV. I utilize facebook for wordpress to connect my facebook account for logging in on the said platform. According to seo services, wordpress and facebook has low SEO value when used for content marketing. Hello John, I really like your blog and youtube channel. I agree with you that Facebook (if they represent the complete personal capitulation on people protecting their privacy foolishly) is the root of all evil. Google is no better; just less seductively out in front about it. It is an understandable phenom but it seems super foolish give these guys are corporations and not accountable in any way to a democratic process or system outside the general canon of law. Don't see it playing out well long term. The only part that feels right to me is that it has empowered people to hopefully see the power we all hold by connecting with one another and in community.